I have been busy helping Grandpa Haxnicks to dig manure into his vegetable plot and learning some of the ins and outs of using various types of animal excrement in the garden. What comes out of the animal and goes into the soil is so much more than a pile of poo. All creatures great and small can provide free plop for your plot that will vastly improve soil texture, boost nutrient levels and give you bigger, better and healthier crops. If you happen to keep chickens, then as well as eggs you have a readily available source of useful fertiliser. Fresh chicken poo has high levels of ammonia so should be dug into vegetable plots at least 4 months before planting. Or you can add it to a compost heap and let it rot down before using it. It makes particularly good top dressing for blackcurrants and plum trees. It tends to be quite alkaline so not so suitable for acid loving plants such as blueberries, or camellias. Cow poo is great for improving soil structure. Again, it should be left to rot down in a compost heap or dug in a few months before planting. Autumn is the perfect time for digging it in, particularly if you want to use it in areas where you might be planning to grow root vegetables in the spring. If you try to grow root vegetables in freshly manured soil the results can be a little alarming. Carrots will grow into multi-limbed aliens, beetroot will go barmy and potatoes go scabby. A great plus point for cow poo is that it has been well digested, passing through multiple stomachs a process that kills off any weed seeds. Weed seeds are something to watch out for with horse manure. So be sure that it is well aged to give time for any seeds to compost. Another benefit of horse poo is that it is considerably less stinky than chicken or cow. But if you want a completely non-stinky manure then worm poo is your best bet. Obviously, it is going to take a biblical proportion of worms to create the equivalent of a few cow pats. However, I am told that you can make worm poo tea out of worm casts from a wormery. You can then feed it to your potted plants! This entry was posted in Potty Gardener and tagged composting, RollMix Composter on 22nd November, 2018 by Potty Gardener. Hello Gardeners, I have some advice for saving money and making your own seed compost. Making any kind of compost does of course require advance preparation, and I am beginning from the assumption that you already have some mature compost. If you don’t then perhaps you might be inspired to get some going for next year. Haxnicks have already considered those of you who may not have space for a full scale composting area in your garden. Have a look at our Rollmix Composter page where you will find plenty of advice on the easiest way to create compost in a small space with our amazing rolling compost bin. It is far simpler and less time consuming to simply buy a bag of seed compost, BUT it will not come with wholesome ingredients of physical effort, self-satisfaction and thriftiness! Any good seed compost should be nutrient rich, moisture retentive, and have a fine uniform consistency that allows for good air circulation. The mix of above ingredients should give you all that. You will also need to sieve the mix to take out the lumps and achieve the fine airy consistency. For many years I have used a large heavy wooden riddle to sieve compost, but since being closely involved in the product design of Easy Riddle I am well and truly converted to using this lightweight garden sieve. Far less elbow grease required! This entry was posted in Grandpa Haxnicks and tagged RollMix Composter, Easy Riddle on 4th February, 2016 by Haxnicks. 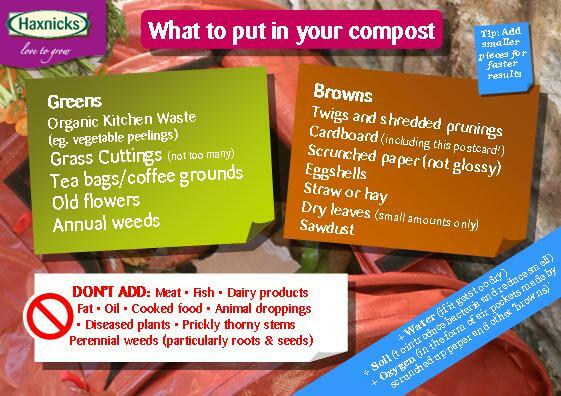 It’s easy to make your own compost with the right mixture of organic kitchen and garden waste. When composting on a small scale it is essential to get the right mix of ‘greens’ (waste with a high nitrogen content) and ‘browns’ (high in carbon and useful to create air pockets). Add them in thin alternate layers and shred waste for easier composting, smaller pieces = faster decomposition. Compost makes a great soil conditioner, excellent mulch for borders (adds nutrients and suppresses weeds) and can even be used as potting compost if you put it through a sieve before use. Watch Rabbie as he tries his hand at composting - click here for the video! This entry was posted in Grandpa Haxnicks and tagged RollMix Composter on 1st June, 2012 by Haxnicks.